Coming from the Bentley Systems ecosystem, I was used to a myriad of applications using the .dgn file format. The obvious benefit of this single file format was real-time collaboration across multiple platforms. However, it did introduce complexities to the applications themselves, especially the trying-to-be-everything MicroStation. Autodesk usually takes a different approach, with application-specific file formats. This has the benefit of optimizing file formats for applications, and the .nwc file format is an excellent example of this. The obvious downside is that there can be no real-time collaboration across platforms, plus the files have to be exported from the source application over and over again. Over and over. Again. 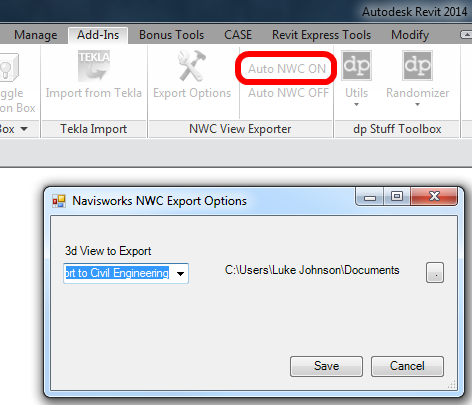 Kyle Morin has solved this problem for Revit to Navisworks by creating an add-in that watches for Revit model changes and updates the corresponding .nwc file associated with a Revit view automatically and in real-time. There's more information available on Kyle Morin's blog.